Brulba Boots is a conforming pair of short, pointy boots for Brulba. It comes with five texture choices and a choice of either .pz2 mat poses or .mc6 material collections for each texture option. 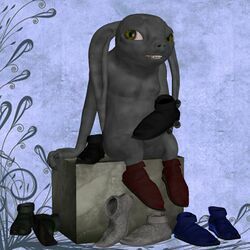 Brulba Boots is created by Nan Fredman and distributed on both her ShareCG gallery and on Renderosity Freestuff. Brulba Boots is licensed for use in all renders both commercial and non-commercial. This page was last edited on 22 July 2017, at 00:06.